Model: The Wiko Jerry is an android-based smartphone manufactured by Wiko, a French company from Marseille with the desire to share their expertise with their customers. From the first impression, the smartphone looks like a trendy and fashionable smartphone due to its colorful design. The smartphone is made from metal and it is comfortable to hold onto. It comes pre-installed with Android OS v6.0 Marshmallow with Wiko UI and has 1.3 Mediatek MT6580M processor, an ARM Mali-400 MP2 graphics processing unit, 1 GB RAM and an internal storage of 8 GB. The storage capacity can be expanded by up to 64 GB using the microSD slot. The smartphone sports a 5-inch IPS display with 854 x 480 pixels resolution. It is optimized for reading and displaying nice looking pictures. It offers decent viewing angles, but the low resolution is a huge let down especially when even the lowest-end devices tend to offer a 720p screen. The Wiko Jerry has a primary 5-MP camera on the rear with features such as autofocus, self-timer, face detection, smile detection, scene modes, face beauty, HDR, professional mode, sports mode and touch shot. While Wiko does not put much emphasis on the Jerry smartphone, the photos taken by the primary camera are considered acceptable. However, the photos may look a little dark and not detailed when compared to photos taken by more superior cameras. It also has a secondary 2-MP camera on the front. The cameras are able to record videos in 1080p resolution and support a wide range of video file formats. For audio playback, Wiko Jerry supports audio file formats such as WAV, ACC+, OGG, FLAC, MIDI, MP3, WMA, AMR, AAC and eAAC+. The smartphone comes with additional sensors such as accelerometer, magnetic sensor, proximity sensor, G-sensor and ambient light sensor. Its connectivity options include the older Bluetooth version 4.0, Wi-Fi 802.11 b/g/n, Wi-Fi direct, GPS with A-GPS support and microUSB 2.0 with OTG. However, the smartphone lacks the feature of NFC and LTE, something that is also a basic feature in many cheaper phones. 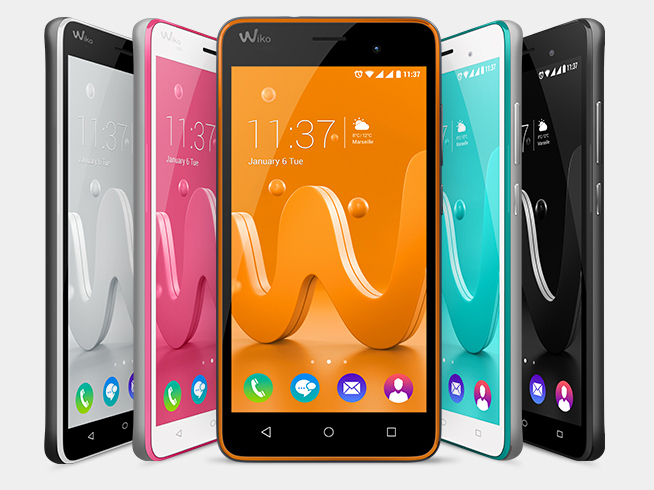 The Wiko Jerry is available in 5 different colors for the user to choose from: Orange/Space Grey, Bleen/Silver, Black/Space Grey, Pink/Silver and White/Space Grey. It has a convenient weight of just 166 g including the battery and it has a 2000 mAh Li-on battery that can last up to 444 hours on standby, 20 hours of talk time and 24 hours of playing music according to the manufacturer. Overall, the Wiko Jerry is an entry-level phone that is suitable for users who are looking to buy their first smartphone and the smartphone is priced decently along with a list of decent hardware specifications. However, it does fall back in terms of its screen resolution and lack of LTE connectivity. 68.85%: This rating is bad. Most notebooks are better rated. This is not a recommendation for purchase.